Novice & new to Mini-Z drivers can race what you brung in the box stock class. 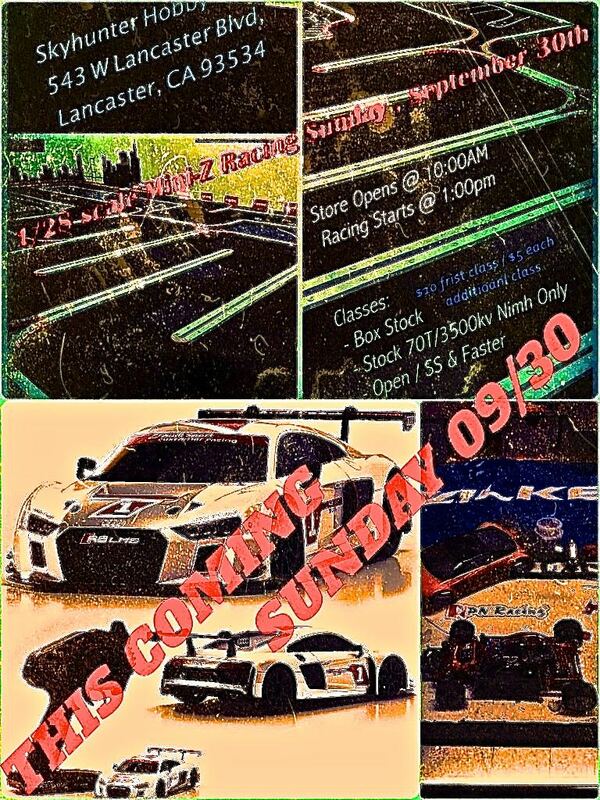 Who is who of SoCal mini-z racing scene are confirmed to attend , good occasion to find out about on-road 28th scale racing in general at this event. Last edited by mugler; 2018.09.27 at 02:00 PM. Great racing at Skyhunter Hobby yesterday as always. Fast and competitive racing in all three classes. Alex won in Box Stock, Phillip in Stock 70T/3500KV, and Cae in Open Class. Looking forward to the next race at Skyhunter. They rotate beween 1/10th drift track and the RCP track for 1/28th scale, and have a great stock of Kyosho and PN Racing parts available, not to mention a fully stocked hobby shop. I'll definitely be back again at their next event. Kudos to the Skyhunter crew for making their hobby shop a great place for 1/28th scale racing! Thanks Bob & looks like they just posted more pics including podium pics on FB page. I noticed some shop staff were randomly shooting videos during races...I'll ask to see if they can upload any of it. Just to follow up on this word got back that videos that were shot were deleted, next time hopefully. Last edited by mugler; 2018.10.18 at 01:44 PM. Nice layout and facility. Wish I was still living in California. Moved to Colorado last week. I will stop by and run some laps, next visit to California. That'll be awesome if you can make it. 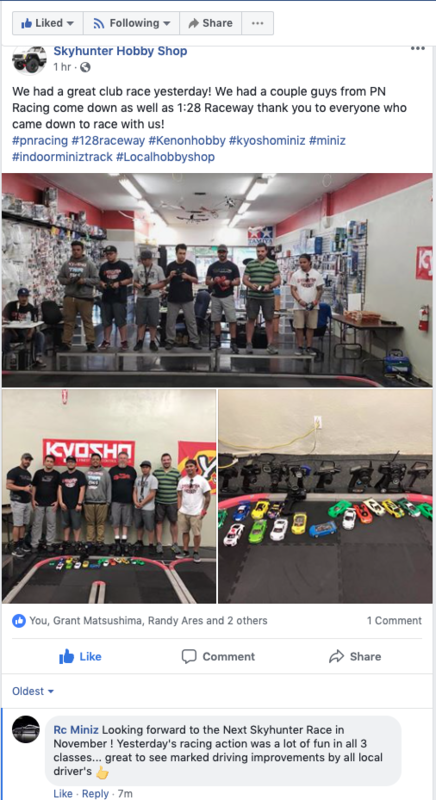 FYI we're trying to schedule the next race with them either on 11/18 or 12/02 (TBD by the end of October) however their track is open during all store hours for laps ... they alternate between RCP & drift tracks 5 weeks at a time so gotta follow them on FB or contact them to make sure they're in RCP rotation before heading out.